Fill the basic application form. A recent photograph and copy of your Iqama must be submitted with the form, make sure to keep that in pocket beforehand. An application number, pin code, and post box number will be provided to you by Saudi Post. A single person or multiple person accounts can be chosen by you. If you choose multiple person accounts, multiple people can use the same address provided their names are registered on it. A maximum number of names that can be registered on one address is ten and it will cost SR300/year. SR100/year will be the cost if a single person account is chosen. The cost for a small company and large company would be SR1000/year and SR 3000/year respectively. The payment is to be paid in your bank. It can also be paid by ATM or phone banking. Do not visit the ATM immediately after filing the form in Saudi Post Office as the system take the time to update, wait an hour or two before visiting the ATM. The method for ATM is quite convenient. The first step will be to visit your nearest ATM and insert your ATM card into the machine. After you will enter your pin code, several options will be displayed. Select Saudi Post from them but if there doesn’t appear to be an option of Saudi Post, just press “Others”. A code will be required and enter “021”. You will then enter the application number that was provided to you by Saudi post previously. After paying the amount mentioned, take the slip. Don’t forget to take your card along with you. Visit the Saudi Post Office and give the slip there. The procedure ends here. Your PO Box Number will be activated once you submit the slip. 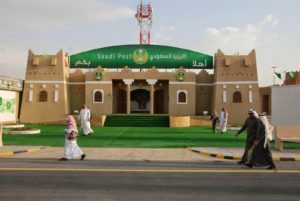 Keys and Post Office card can be collected from the Saudi Post Office after 2 days.